While I don’t know that there is such a thing as too-much-Disney, I will say that it was refreshing to watch some un-Disney characters on the flight home from Disney World last week. 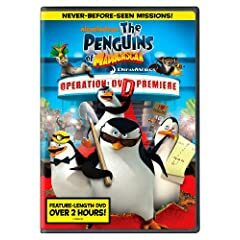 My boys watched the new Penguins of Madagascar Operation: DVD as we flew home from a fun-filled week in Disney World, and I have to say I was laughing right along side them at some of the takes in this movie. You probably remember the Penguins from the Madagascar movie – I know that they were personal favorites of mine. While watching this movie, I was reminded of how I used to love watching the Tracy Ullman show for the short Simpsons skits all those years ago. The Penguins definitely steal the show and continue to entertain in Operation: DVD, the first full DVD feature the Penguins have to themselves. It’s a steal at $11.99 on Amazon right now ($26.99 retail) – and fyi, it’s a full 2-hour feature so you are definitely getting a movie out of this purchase.